edited by Zaira M. Berdiñas and John Strachan. I’ve recently visited the Instituto de Astrofísica de Andalucía (IAA-CSIC) located in Granada (Spain) and there I met up with Pedro Amado. 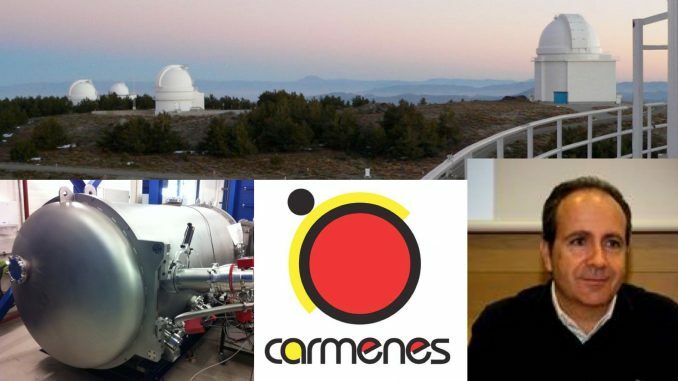 I was curious about CARMENES, a world-renowned instrument installed at the Calar Alto observatory of which Pedro is the Spanish principal investigator: so I decided to take advantage of my visit and interview him. CARMENES is a spectrograph specifically built to detect habitable Earth-like planets orbiting stars much cooler than the Sun, aka. M-dwarf stars. Like HARPS, it is a high-resolution spectrograph but with the novelty of including a near-infrared arm besides a visible one. In this way, we have better coverage of the wavelength range where M dwarfs emit more flux. Thus, we can say that CARMENES is like “HARPS” but specifically designed to find planets around M dwarf stars. Since it was installed at the end of 2015, CARMENES has confirmed several planetary systems, but the expected big discoveries will come along with the optimization of the near-infrared arm. 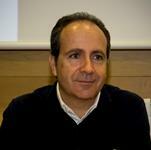 But let’s talk with Pedro Amado, who is the real expert and lead role in the CARMENES project. Enjoy the interview! 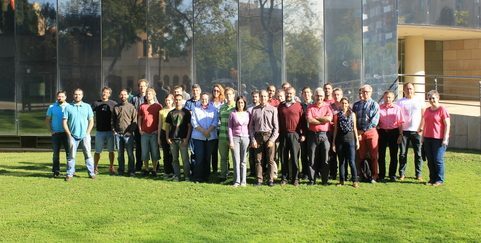 Some members of the CARMENES team during a meeting in Barcelona. Credits: CARMENES CAHA. CARMENES… who named it? what these initials mean? [PA] The night before the presentation of the idea at Calar Alto instrumentation Workshop, I started to think that we did not have a catchy name, or even a name at all, for our instrument, something that kept me awake for the most of that night. Playing with the initials of Calar Alto (CA) and Near-Infrared Echelle Spectrograph (NES) I wanted a name that could be easily associated with Granada as that had been the naming convention for other surveys carried out by IAA researchers. I eventually came up with the name CARMENES, meaning, “Calar Alto Radial velocity MEasuring Near infrared Echelle Spectrograph”. Yes, a little bit far fetched but catchy! CARMENES is the plural of Carmen, a typical house in Granada with garden (probably from the arab word “Harmen”=garden). It is also the plural of the Spanish woman name, Carmen, and it is only coincidental that both my wife and my daughter are named Carmen ;-). In your own opinion, what makes CARMENES unique? [PA] Currently there is no other instrument in operation that covers both, the optical and the near-infrared parts of the spectrograph, yielding the largest wavelength coverage at the high spectral resolution provided by CARMENES. Another aspect is that the work to be done with this instrument benefits from large amounts of telescope time which can only be provided by a dedicated telescope. This is the case of the 3.5-m telescope at Calar Alto Observatory, a telescope of superb quality at the largest observatory in continental Europe. The posits … the brainwave of adding glue to a small piece of paper! In science, like in real life, brilliant ideas are the germ of everything. In your mind, how did the ideas for CARMENES come about? [PA] CARMENES is born from the combination of two general ideas and team efforts, one from Spain and one from Germany. The original concept of the instrument included three modules, two visible (single- and multi-object) spectrographs (Germany) and a NIR high-resolution spectrograph (Spain). The core of this concept, the NIR cannel, was based on the concept of another project, viz. NAHUAL (P.I. Eduardo Martin), to build a NIR spectrograph for the GTC (La Palma, Spain). I, together with Eduardo Martin and Rafael Garrido, pushed to present this new instrument for the 3.5 m telescope at Calar Alto. Dome (left) and 3.5 m telescope (right) of CAHA. Credits: CARMENES CAHA. From the drawing stage to the first science spectra, what would you claim as your best day at the head of CARMENES? And the worst? Were there some moments in which you would have preferred to give up and go and chill out on the beach? [PA] Well, there always are bright and darker moments in any project. Ups and downs, like when I argue with my 4-year old daughter (my main project right now) over something, she gets immediately extremely upset and thirty seconds later she has forgotten and is again laughing and playing with me. Two of the “up” moments were when we tested successfully our original design for the CARMENES cooling system and when we obtained the first spectrum with the two channels during commissioning. The darker moments…well, our brain has evolved to forget more easily, in the long term, bad times and remember mostly the good times, therefore, I have to say that I do not (want to) remember any bad times. However, in the short term, I cannot forget what we are currently doing. One of my main responsibilities now is to scientifically exploit the instrument, which I am unable to do as I should because of the lack of resources, in particular funds for contracts of young researchers, here in Spain. First light images. Left) CARMENES focus BD+24 2733AB and a background star during the commissioning of the instrument. right) First raw spectra obtained with the visible spectrograph. CARMENES is located at the biggest telescope of the Calar Alto Observatory (Almería, Spain), can we visit it? [PA] Yes, the telescope is impressive, the dome colossal and yes, it can and should be visited. If anyone is interested, just click on the following link. Many people are unaware that the impact of astronomy is present in our homes, and I don’t mean stargazing from the yard. There is plenty daily used technology which was firstly developed with an astronomical purpose, e.g. the ceramic hobs for cookers, that resulted from the need for harder mirrors to be developed for telescopes. Which was the most relevant technology transferred by CARMENES? [PA] CARMENES is relatively speaking a simple instrument, designed specifically not to need large innovation and technological developments. The technology is simple and was readily available when we built the instrument. Therefore, this project will probably not be identified for having produced a large impact in technological advancement which could be directly transferred to address society needs. That said, our cooling system is an innovative idea that is not being used in any other instrument, and which may be susceptible for technological transfer. Testing the Cooling System of the near-infrared spectrograph at the IAA laboratory. Credits: CARMENES-CAHA. Compared to other countries, leading such a big project from Spain increases your chances of being gray-haired? [PA] If white hair is a sign for accumulated wisdom, then I can say that, yes, I have hard-earn some of them. However, the amount may depend on how hard we have to work to gain that experience. And in Spain, for sure, we have to work harder to keep the level of competitiveness with respect to other countries (in the case of this project the reference is Germany). Lastly, what do you think will be the CARMENES’s scientific discovery that our children will remember? [PA] I would be really happy if my daughter could point to a star where signs of life were discovered in an orbiting planet and she could say “my dad worked to build the instrument that discovered that planet”. Pedro J. Amado is one of the heads of the CARMENES project, in particular, he is the Spanish principal investigator (co-PI) of the Spanish-German consortium implementing the project. Dr. Amado is part of the permanent staff at the Instituto de Astrofísica de Andalucía (IAA-CSIC) which is in charge of delivering the near-infrared arm of CARMENES, one of the most innovative parts of the instrument. Dr. Amado got his PhD from Queen’s University of Belfast in 1997. His research initially focused on modelling the starspots populating the stellar surfaces and he later moved on to research in asteroseismology. Currently his career is focused on the search for exoplanets with radial velocities as well as in the instrumental development of CARMENES.